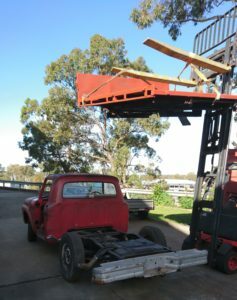 The Farmtruck is progressing well, the 1966 F100 cab rear corner rust was repaired and then the cab was dropped onto a refurbished 1977 F100 chassis. 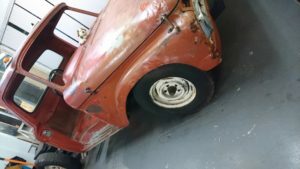 This has given the farmtruck a twin I beam front suspension, disc brakes with booster and the late model steering coloumn. A brand new complete wiring loom has been fitted with a 21 circuit fuse panel. A complete door window runner and seal kit has been installed, as well as a brand new laminated windscreen. To ensure an improved ride there are new 245/70 tyres fitted to original F100 rims, brand new shocks front and air shocks in the rear. An orignal farm style steel tilt tray has been added in the back with reclaimed hard slat sides added using hand fabricated brackets, the dog leash came with the tray !